« Take a Maine Maritime Museum Lighthouse Cruise! Summer is cruising by with alarming speed but that only means autumn is on the way and with it an opportunity to take in one of the most beautiful sights around: the annual, natural fireworks display that is Maine fall foliage! There’s nothing quite as spectacular as the spectrum of warm and bright, earthy hues that slowly takes over summer’s greens to dress the landscape in an eye-pleasing crazy-quilt of oranges and reds, yellows, tans, and browns. Nowhere in the US – perhaps the world! – is this transformation more evident and stunning than in New England. Of all the New England states, though we may be a bit biased, Maine fall foliage, with its 57 species of broadleaved trees, is the most resplendent, the most worthy of your attention. Well, that’s not as easy to answer, unfortunately. Mother Nature has her own idea about schedules and the peak time to take your Maine fall foliage getaway varies from year to year. Lots of variables – everything from temperatures, wind, rain, even insect populations and the angle of the sun – make predicting the optimum Maine leaf-peeping week more than a little difficult. That being said, there are lots of resources out there to help you make an educated guess. The Maine Department of Conservation website, for example, releases weekly reports on Maine fall foliage conditions throughout the months of September and October. A similar map here even makes some predictions for the 2015 season. Even without such resources, it’s relatively easy to guess at a good ballpark if you know the usual trends and where you hope to visit: The turning can begin as early as mid-September, up in northern Maine and continue as late as Halloween, down in Maine’s southern tip. Aiming for a late September/early October Maine fall foliage getaway should put you smack dab in the middle of a typical season. The farther north you plan to be, the earlier in the season you’ll want to aim and later, the farther south. In the Freeport area, home to Brewster House Bed & Breakfast, late September is usually the earliest you’d want to come for Maine fall foliage. 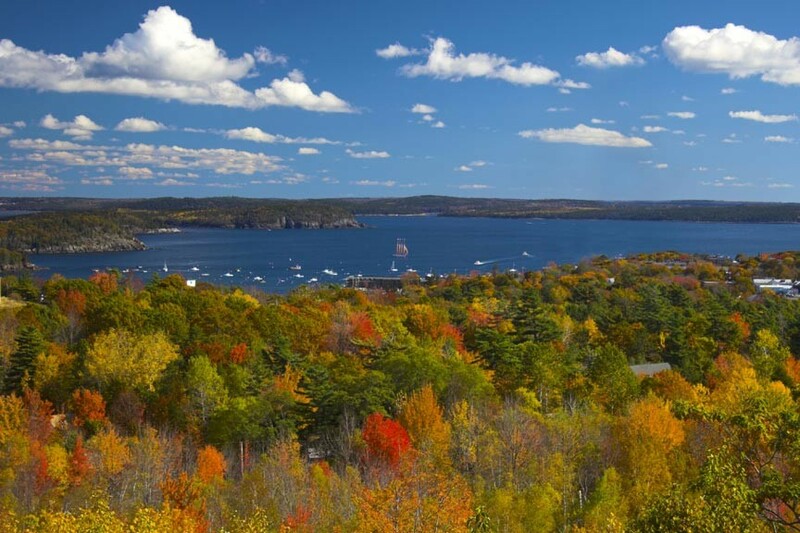 Our leaf-peeping opportunities are particularly spectacular with lots of scenic back roads, autumn festivals, fairs, lighthouses, and lobster shacks to visit in the enhanced autumn landscape. With this in mind, we have put together a number of Brewster House Bed & Breakfast specials to help you make the most out of your Maine fall foliage getaway, most specifically our popular Fall Colors Surf and Turf Special. This special gets you two nights for two in a queen room, with a self-driving tour of the region’s best Maine fall foliage areas, a view of the Casco Bay foliage from the deck of a graceful Maine schooner, a $100 shopping spree at the Freeport L.L. Bean, a $50 restaurant gift certificate, and a $50 gas card to help with travel costs! And all available from September 20, 2015 – October 31, 2015. Be sure to visit the Fall Colors Surf and Turf Special page for full details. Whatever shape your Maine fall foliage getaway takes, Brewster House Bed & Breakfast in Freeport, Maine wishes you the very best!